Home » Newsroom » In the news » 2018 » Do Financial Inclusion Efforts Really Have an Impact on Poverty? Several years ago, a senior person at a large foundation (let’s call him Fred) asked us if we thought financial inclusion—creating and supporting financial products and services designed for low-income communities—really made a difference to the poor. We took his question very seriously, and answered that we honestly weren’t sure whether it was as high up on the charts as investments in health or education. He was less ambivalent. He was adamant that finance actually underpinned every challenge low-income people faced—whether housing, sanitation, health, or education. He felt having the right financial tools and strategies was critical to the success or failure of all poverty-alleviation interventions. We’ve returned to that conversation often, especially now that the field of financial inclusion seems to be at a crossroads. Donors, financial providers, researchers, and consultants are trying to decide which way to turn next. The field started with microcredit, then developed a range of financial tools, including insurance and savings products. But at what point can the financial inclusion field declare victory? Thanks largely to the spread of mobile money, the number of adults without a formal account decreased from 2.5 billion to 2 billion between 2011 and 2014, and the latest Findex survey for 2017 (which will be released later this year) will likely show further progress. But if people aren’t using these accounts, then we can surmise they aren’t having any impact at all. And even if they do use them, how do we know that they are making a real difference to the lives of low-income people? While access to financial services has grown impressively across a range of countries, evidence that it’s improving the lives of the poor has been less clear. Leora Klapper and colleagues at the World Bank made a connection between financial inclusion and the UN Sustainable Development Goals (SDGs) in a 2016 UNSGSA paper. While the SDGs do not explicitly target financial inclusion, the authors mapped the evidence base of financial inclusion impact to 10 of the 17 SDGs. Among the research they surveyed, work by Tavneet Suri of MIT and Billy Jack of Georgetown University was the most rigorous. Suri and Jack conducted five rounds of a household panel survey in Kenya during a time when the use of the mobile money system M-Pesa—a low-fee service that allows users to easily deposit, withdraw, or transfer money via their mobile phones—was on the rise. Suri and Jack ran the first rounds of their panel survey between late 2008 and early 2010 to measure the impact M-Pesa had on risk sharing (giving or taking money or goods when there is a shortfall), between family members who were dispersed by internal migration or driven by opportunities and employment across long distances. They found that users of M-Pesa are not only more likely to receive more remittances, and from a wider network of sources, but also better withstand unexpected expenses or decreases in income. In Suri and Jack’s more recent 2016 paper, they used all five years of their panel data study between 2008 and 2014 to study the effects of M-Pesa on long-term household consumption. Their analysis reveals that, over that time period, M-Pesa brought an estimated 2 percent of Kenyan households out of extreme poverty (those living on less than $1.25 per person per day). On the one hand, it’s impressive that a simple mobile money product can contribute to alleviating poverty at all. On the other hand, compared with other types of interventions for the poor, such as bed nets and vaccinations, one can’t help thinking: Seriously, that’s the best we’ve got? But perhaps we’re doing financial inclusion a disservice by thinking about one-to-one impact—the idea that a financial tool alleviates poverty. There are good reasons for changing our focus. First, impacts from financial services can happen very slowly and usually result from sustained use of a financial service over time—impatient observers likely won’t see much impact. A second reason is conceptual: Digital finance has myriad, interwoven effects on people’s lives. A financial decision like taking a loan has consequences on livelihoods (Will the loan for buying fertilizer work, or will the crop fail? ), stress (Does the loan carry a sense of pride or create anxiety? ), time management (Is the borrower now obligated to attend meetings? ), and risks (Will the borrower be able to pay it back?). In this way, Fred’s point about finance underpinning so many aspects of the lives of consumers is perhaps our first clue that evaluating the impact of financial inclusion, product by product, is exactly the wrong way to proceed. The diagrams below demonstrate this graphically. More than three quarters of Kenyan adults subscribe to M-Pesa, and usage levels are consistently high. Based on these yardsticks, it is an undoubtedly successful product. However, M-Pesa’s ultimate impact on the lives of users (and the proportion of people it impacts) becomes decidedly anemic as we move from measuring access to measuring usage to measuring impact on poverty alleviation. Looked at this way, financial inclusion appears to have a very weak return on investment. 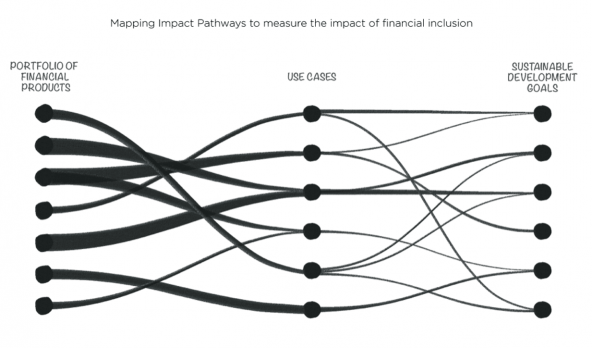 But perhaps we’re simply not recognizing all the other impact pathways—ones driven by a range of financial device use cases. If we consider all the impact pathways coming from all the use cases, the impact could be much stronger. It’s like a big thick wire powering an industrial-sized lamp; if you cut open that thick wire, you’ll find many smaller wires running through it. Without each of those thinner wires, the light either diminishes or doesn’t work. To make this concept of multiple use cases concrete, think about mobile money itself. As Suri and Jack found, the most common use case with M-Pesa is to get money as remittances from other people, but you can also use it to pay—usually another person or institution. The pay use case can impact someone’s life by strengthening the social networks that Suri and Jack cited. Pay also opens up user access to services like pay-as-you-go (PAYGo) energy, a micro-payment service that provides low-income households with clean and affordable fuel. PAYGo tends to increase the number of hours a household uses light, which in turn increases safety and security. Ultimately, it may lead to better learning (students can do their homework at night) and greater productivity. Over time, using a cleaner fuel may lead to fewer health problems. If the patterns of strong re-payment behavior are captured and provided to other financial institutions, users may gain greater access to loans and credit, which may improve livelihoods. The PAYGo model may ultimately work for other assets such as sanitation and water, or mobile money payments could enable new ways to pay. In short, paying via mobile money can unleash myriad benefits that combine, split, and loop around other benefits. 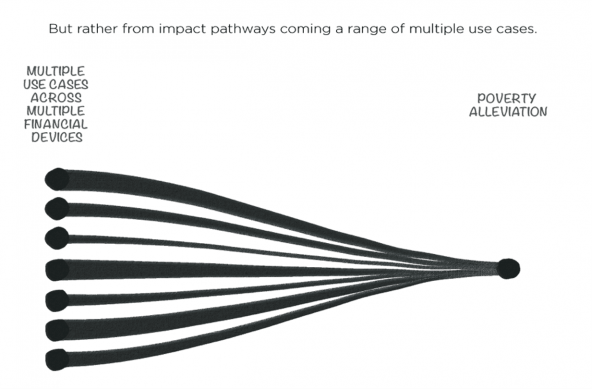 From one pay use case, there may be as many as 10 different impact pathways we can follow. But mobile money also enables money management, storage, and information. We could discuss six different use cases for one mobile money financial instrument and attach each to multiple impact pathways that lead to a variety of SDGs. Financial Diaries studies—ethnographic research that tracks the daily cash flows of low-income households with fortnightly interviews over a year—have found that each household tends to have between 10-20 distinct financial devices in their portfolio, each of which have multiple use cases leading to multiple impact pathways. Add it all up, and we can measure a lot of impact pathways finance could be powering, including improved livelihoods, greater resilience, better housing, safer water, improved health and education, and more clean energy. Now we’re talking about the type of impact Fred was talking about. This concept is based on a new approach to impact measurement pioneered by the Pacific Financial Inclusion Programme (PFIP) with conceptual and technical support from our financial inclusion advisory firm, BFA. PFIP is a United Nations Capital Development Fund program dedicated to reaching low-income Pacific Islanders with useful formal financial services and supported by the Foreign Affairs Departments of Australian and New Zealand, as well as the United Nations Development Program and the European Union. The approach complements existing rigorous evaluation methods by focusing in on specific financial services customers and using light-touch methods to understand their progress along these impact pathways. Our hope is to see more people starting on a wide range of pathways. While it would be unrealistic to expect that PFIP will lead to registering a change in SDGs, its customer-centered approach is particularly well-suited to development initiatives implemented within a timeframe and budget unconducive to academic studies of impact. This framework of impact tracking is a work in progress; it will be tested on the PFIP portfolio throughout 2018. Together PFIP and BFA hope to promote a community of practice that will use this feedback to enrich and improve the methodology. It behooves everyone engaged in this work to remember our ultimate goal: improving the lives of the poor. We must determine how to holistically measure how finance impacts the lives of the poor, because if we can’t measure it, we certainly can’t tell anyone—our donors or ourselves—whether our efforts are paying off.